This wonderful bolo offers the refined modernist designs of the White Hogan Shop’s silver jewelry. Lead by mentors, such as Kenneth Begay and the Kee brothers, jewelers working at the White Hogan produced an amazing array of modern designs in jewelry and flat ware. This beautiful necklace depicts this style of work perfectly. Allen Kee worked at the White Hogan during the early years. 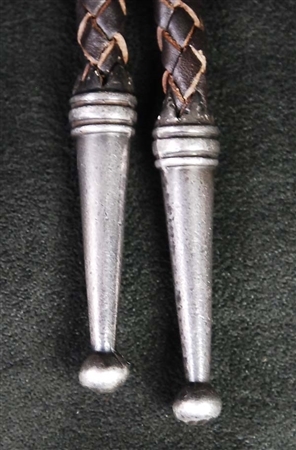 He was a experienced silversmith that created the desired designs of the White Hogan’s style of jewelry. 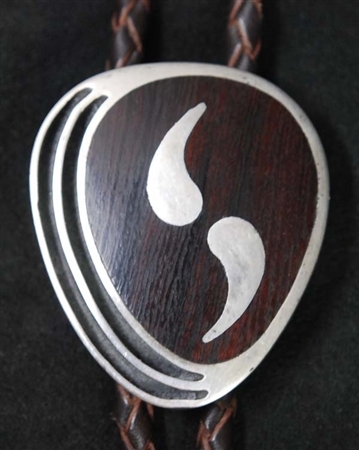 This lovely bolo has a silver inlaid design, centered in a beautifully-grained dark brown desert ironwood teardrop. Hand crafted bolo tips add the final touch to this attractive bolo. It measures 1 1/2" long by 1 1/4" wide, with 1 1/4" hand crafted bolo tips. Over all leather length is 38". The bolo has a fairly heavy weight. It is absolutely beautiful on! 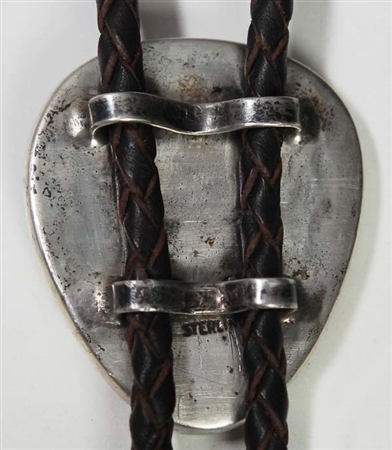 It is hallmarked with the White Hogan’s shop mark, sterling and his connected AK. The hallmark is under the bottom silver bar on the back.